Do you have your spot reserved for the EVENT of the summer? Shake, Rattle and Roll your way to the 14th annual Siuslaw Athletic Booster Club Vintage Viking Booster Bash Auction and Dinner on Saturday, August 11th, at the Florence Events Center. 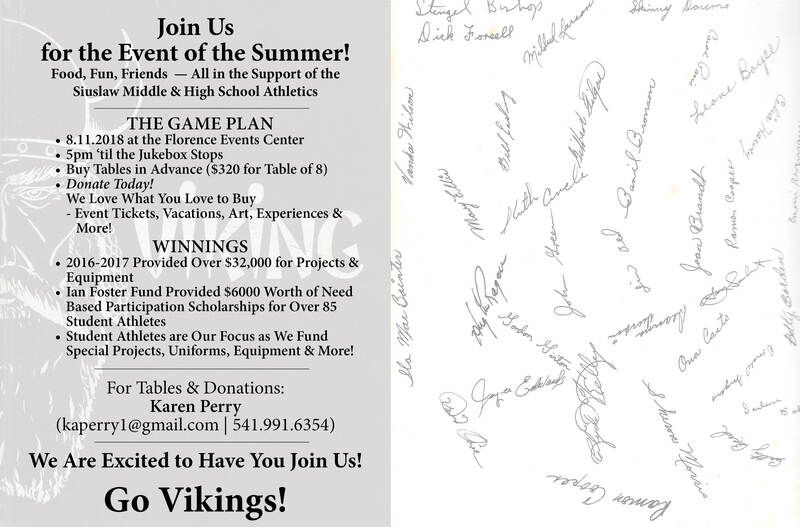 The party starts at 5:00 P.M. Support your Siuslaw Viking athletes at the event of the summer! Tickets are $40 ($320 for a table of 8) and include a diner-style dinner, beer, wine, and other beverages including a specialty cocktail available for purchase benefiting the Dan Barnum Scholarship. Play Heads or Tails for a $500 REI gift certificate and support the Ian Foster Scholarship Fund. The evening includes the Heads or Tails game supporting the Ian Foster Scholarship Fund, Coaches’ Corner, Mystery Wines, Silent Auction, a Dessert Dash featuring three local bakers, and a Live Auction. Contact Karen Perry at 541-991-6354 or kaperry1@gmail.com to reserve your tickets. Suggested attire: 50’s style, vintage Viking (any era), vintage athletic, or casual. 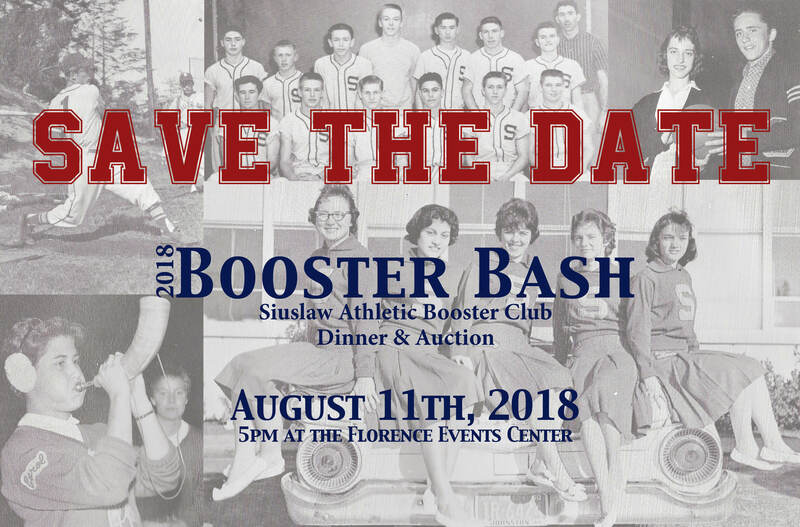 We are pleased to announce the “Vintage Viking Booster Bash” – the 14th annual Siuslaw Athletic Booster Club Auction and Dinner on August 11, 2018 at the Florence Events Center. Food by Pavilion Catering will provide 50’s diner-style small bites. The Tipsy Mule (visit on Facebook) will be serving complimentary beer and wine throughout the event, and a Signature Cocktail will be for sale to benefit the Dan Barnum Scholarship fund. This year’s Dessert Dash will feature 3 different Bakers making a variety of cakes, pies, cobblers, and gourmet bars. 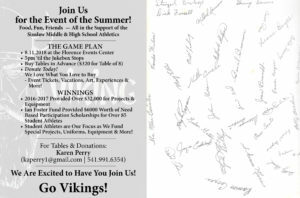 The Auction will host both the annual silent auction and popular Live Auction with all proceeds going toward the Booster Club activities throughout the year. Each auction we host approximately 250+ guests and we can’t wait for this year’s event! Tickets are $40/ea or tables of 8 for $320/each. The party starts at 5pm and goes ’til the Jukebox stops! We are excited to have you join us! Go VIKINGS! The Siuslaw Athletic Booster Club (SABC) has consistently raised between $25,000 and $50,000 at our auction each of the last 13 years. During 2016-2017 the Booster Club was able to provide over $32,000 for Siuslaw Middle School and High School Athletic projects & Equipment. Next, the Ian Foster Scholarship Fund supplies has provided $6000 worth of need based participation scholarships for over 85 Siuslaw student athletes in both middle and high school students for participation fees to be in a sport. These are students who could not have participated without this assistance.This fund is a very important tool for coaches and a project near and dear to our heart. Finally, SABC assists in many school sports projects including special needs, uniforms, equipment & more! We are here to help and to partner with our coaches to foster successful athletics programs and successful individuals. In our small community athletics provide positive opportunities for a large number of students as well as an important opportunity for the community to gather together. 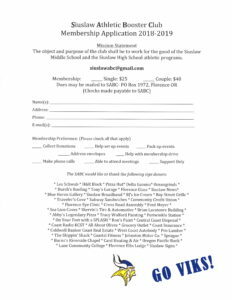 The 2018-2019 Membership Form is here. Whether you are a renewal or new, we’d love to have your active participation with Membership, but even a membership can help. 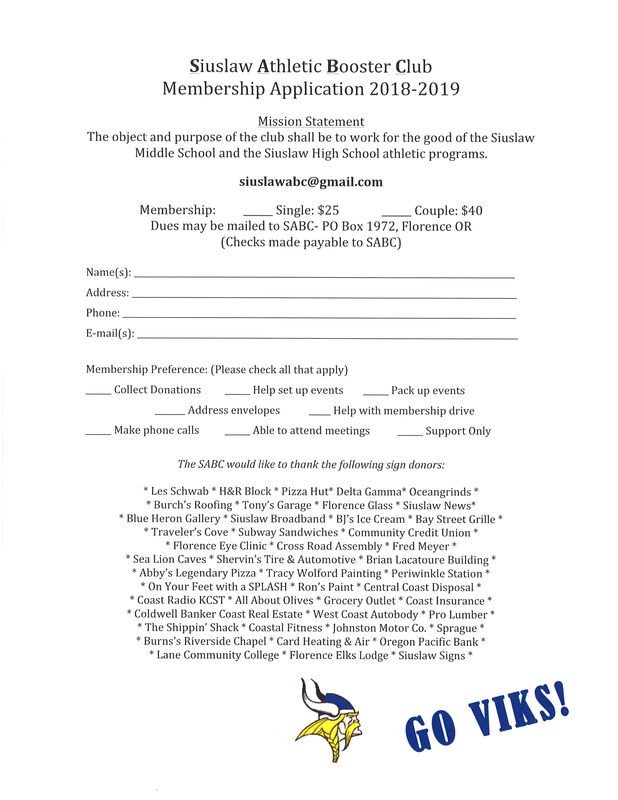 Please support our local Middle School and High School Athletics and mail your membership form today. Club meeting scheduled for next Monday, April 30th at 6:30pm in the high school library. Also, there will be a Booster Auction Meeting held on Thursday the 26th at 6:30pm in the high school art room. If you’d like to help plan and support the annual auction fun, please attend this meeting. We will definitely be needing volunteers for this event. NOTE: Siuslaw Athletic Booster Club Meeting has been moved from the last Monday of the month due to Spring Break . Join us for the next meeting on Monday, March 19th @ 6:30pm in the Siuslaw High School Library. All are welcome! Meetings are the last Monday of the month at the high school library at 6:30pm.